Nothing spoils an arm workout more than a blast of twitches roiling through your biceps. While it is common for a muscle to twitch immediately following a particular exercise, or even several hours afterward, excessive muscle twitching in the arm or spasms can be difficult to deal with and may hamper your strength-training progress. While all twitching may feel the same, there are actually several variables that you need to assess before you can treat the problem. Read more: Does Exercise Cause Muscle Twitching? First, determine if you're having a twitch or a muscle spasm. The two incidents are often conflated with each other, but have different causes and different symptoms. Spasms are rather violent contractions that impact an entire muscle group, which for the biceps in a given arm would include the entire biceps area. A twitch is more localized and less pronounced, often with more subtle visual activation. For the biceps, this would include the involuntary activation of one of the biceps heads, for example. Muscle spasms in the arm are often caused by heavy, repeated exercise that concentrates on compressing a particular muscle group. 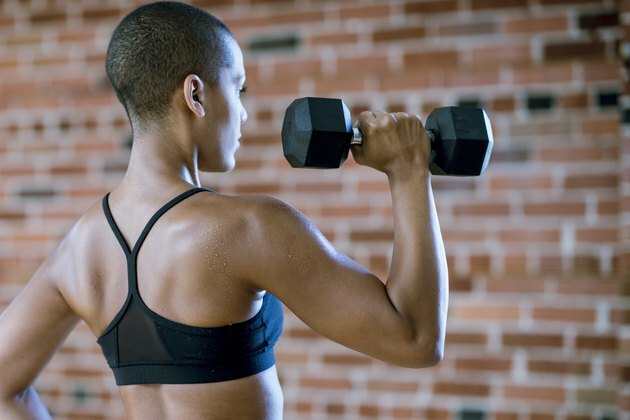 For the biceps, isolating exercises like standing or seated curls using heavy weights and multiple repetitions may induce spasms during a workout, immediately following it, or up to several hours later. Dehydration may also induce muscle spasms overall, but not specifically within the biceps. Twitching can also be caused by intense exercise, but it need not be. Other causes include excess caffeine or alcohol consumption, anxiousness or a magnesium deficiency. Bicep spasms are often isolated events that dissipate soon after your workout, but the onset of them can be reduced or even eliminated by stretches that lengthen the biceps. One good way to do this is to follow each set of biceps curls with a set of triceps extensions. Contracting and extending the biceps muscles in roughly equal measure, with weighted resistance for each motion, will usually diminish or entirely eliminate biceps spasms. Keep hydrated throughout your workout, and end each arm workout with a set of cool-down stretches that loosen the muscles you've worked out. Muscle twitches that continue after a workout can also be treated at home with a hot shower or warm towel to increase blood flow to the affected area to help the bicep spasm relax. Alternatively, ice can be applied to the area to decrease pain caused by the muscle twitching in your arm, according to the Mayo Clinic. While muscle spasms and ordinary muscle twitching in the biceps or elsewhere is nothing to worry about, one type of chronic muscle twitch may be indicative of a more serious problem. If you have chronic issues with a particular muscle area in your biceps that keeps twitching without relief and regardless of exercise, and you can visibly see the muscles contract through your skin, you may be experiencing the effects of nerve damage and the onset of a degenerative condition, such as amyotrophic lateral sclerosis (ALS). If you suspect a muscle twitch of being fibrillative, a doctor can run a series of tests to diagnose the issue.